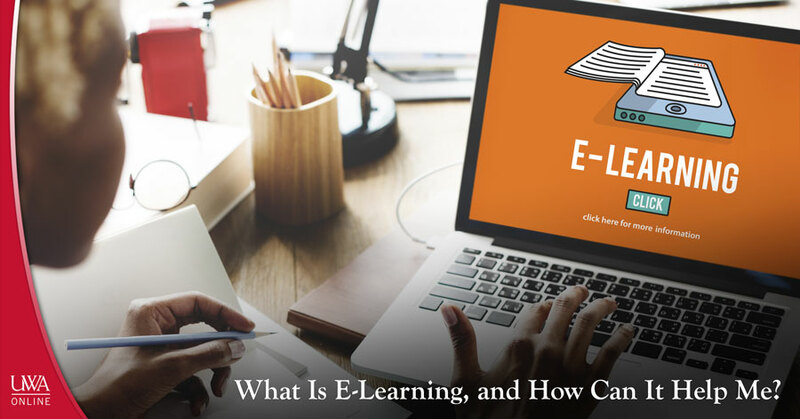 What Is ELearning, and How Can It Help Me? Email, ecommerce, ebusiness—what do they all have in common? Obviously, they all start with “e,” but that letter signifies their common ground—that they are electronically based. The same goes for eLearning. Courses are delivered through the internet to somewhere other than the classroom where the professor is teaching. It is interactive so that the student can communicate with teachers and other students in the class. Sometimes it is delivered live so that students can interact in real time, and sometimes a lecture has been prerecorded. Either way, there is always an instructor interacting with students, evaluating their participation and grading their assignments and tests. The benefits of eLearning are simple: most everything happens on your terms. You can work according to your own schedule, at your own pace and in the comfort of your own home. The material is available to you at your disposal so that you can study it when it is convenient for you, and you can revisit it as many times as you need to in order to get a better understanding. You also do not have to deal with many of the headaches that go along with taking courses on a college campus, including traffic, parking and classroom distractions. Despite the tremendous benefits eLearning offers, it is not for everyone. Due to the fact that it does offer such flexibility, self-discipline, dedication and strong time management skills are a requirement for students who decide to go the eLearning route. Elearners should be confident that they can consistently complete their course requirements and keep up with their classmates (called “cohorts” in the eLearning world). Though eLearners will not share the same physical space as their cohorts, they will still be expected to interact with them about the material using discussion boards and other components of an online classroom management system. If these tasks seem manageable to you, then eLearning could be something you want to consider! The majority of people who use eLearning thoroughly enjoy the benefits it affords. Some studies have even shown that students have been more successful with eLearning compared to the traditional classroom due to the opportunity to have the material available to them at their convenience. At UWA Online, our continuing education program follows the eLearning model and features a variety of noncredit courses that are open to anyone with an internet connection! To view our course offerings or to register for courses, click here! Posted on April 18, 2017 , updated on April 17, 2017 · This entry was posted in Continuing Education, UWA and tagged Alabama, Continuing Education, eLearning, lifelong learning. Bookmark the permalink.